- Get a warm glow all over. - This light, natural looking bronzing powder gives you the perfect sunless tan you want...any time of the year. talc, isostearyl neopentanoate, polybutylene terephthalate, magnesium stearate, acrylates copo- lymer, phenyl trimethicone, polybutene, methylparaben, aluminum hydroxide, stearic acid, propylparaben, ethy- lene/va copolymer, tocopheryl acetate, cocos nucifera (coconut) oil, paraffinum liquidum/mineral oil/huile minerale, parfum/fragrance, aloe methylpropional, ben- zyl salicylate, citronellol, hexyl innamal, hydroxyisohexyl 3-cyclohexene carboxaldehyde, linalool, butyl- paraben [may contain +/-:mica (ci 77019), titanium dioxide (ci 77891), iron oxides (ci 77491, ci 77492, ci 77499), ultramarines (ci 77007)]. Lage size, easy to apply, nice texture to the powder. I found the colour to be quite orange on my skin... I can only use a tiny bit as an all-over glow, any more and my face turns orange. I usually use this during winter when my skin is a little lighter than usual. I use a small amount and blend really really well so that it looks as natural as possible. The compact lasts ages because its quite large, and even longer because I don't use much. I prefer other bronzers to use when contouring etc. 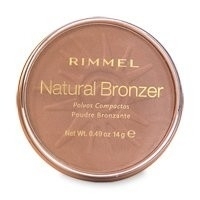 Like most bronzers this product does a good job. They are designed for a light dust over the face for a sun kissed glow so it is almost impossible to overdo it. However, even with a light dusting I found that this bronzer had an unnatural orange tint which does not look natural even in comparison to the rest of your body if you have a tan. The powder does last a long time and does not irritate your skin but I prefer a more convincing natural shade. Great for a touch of colour! Quick to use and gives you a hint of colour.